Cynicism has become almost a clich. It pervades the culture and defines the age--and threatens to derail faith. Andrew Byers identifies the primary factors in the church that inspire disillusionment rather than faith, but he goes beyond that to help struggling cynics channel their frustrations into the redemptive vocations found in the Bible: the prophet, the sage, the tragic poet. These all find their fulfillment in Jesus, and he in turn inspires cynics from the apostle Paul to you and me to embrace our saintly calling--hopeful realism. "Andrew Byers takes a hard look at the broken, bitter and jaded in the church who are at a fork in the road. He offers a path of faith paved with hope and healing in the footsteps of the best models of Scripture. Byers is a humorous, unassuming and sympathetic guide, one worth following down the better road." "Cynicism has spread to outbreak proportions--particularly in my generation--and many of us too easily succumb to its sickness. 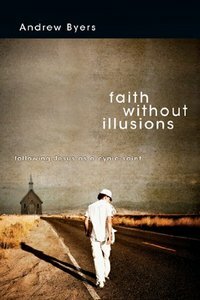 Faith Without Illusions: Following Jesus as a Cynic-Saint^ is exactly the shot-in-the-arm antidote we need to remain mercilessly realistic and yet still cling onto hope." Call it burnout. Call it enlightenment. Call it whatever you like--it's plaguing the contemporary church. Andrew Byers calls it cynicism--the state we all too easily arrive at after passing through disillusionment. Too many saints in the making are having their wings clipped in this painful process. But wait--there's hope. Disillusionment is, at its heart, the dispersal of illusions, pointing us toward what's really real--a great cloud of hopeful realists who have gone before us and welcome us into their number. There is a way beyond cynicism, and if we follow Jesus through it, we'll find faith and life at their fullest.